I created this line of Zazzle giftware adorned with Metatron’s Cube. I added the seven chakras to it along with a blue background. 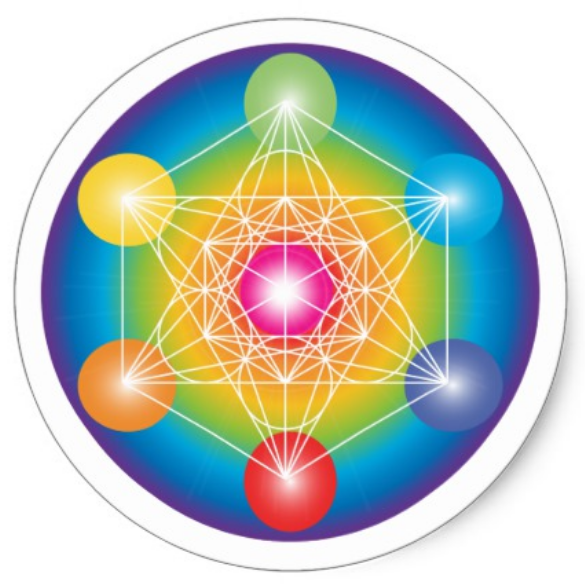 Metatron’s Cube is a sacred geometric pattern that comes from the Flower of Life. It contains the five Platonic Solids (Star Tetrahedron, Hexahedron, Octahedron, Dodecahedron and Icosahedron), which are the building blocks of life (the five elements of fire, earth, air, aether and water). The circles are feminine and the lines are masculine. Metatron is an archangel who heals us using this sacred geometry.